The void ratio in this performance radial has been re-distributed for increased tire-to-road contact which leads to improvements in treadwear and handling. Pitch sequence has been optimized to reduce tread related tire noise for increased consumer riding comfort. 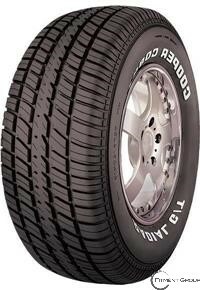 A delicate balance between all-season traction capability and excellent treadwear has been achieved in this radial. Low stretch polyester plies along with strong steel cord belts provide a tough tire body for excellent durability. Available in a full selection of popular sizes, the Cobra G/T offers a unique, stylized, raised white letter sidewall to enhance vehicle appearance. The reverse side offers a serrated, black-letter look for a more subtle effect. Some sizes are available in black lettering only featuring a reversible option: stylized sidewall on one side and a traditional, smooth sidewall with standard lettering on the reverse.